Alfred Newman was the oldest of the six children of blacksmith Charles Newman and his wife Emma Levitt of Swaffham Bulbeck, Cambridgeshire, England. Above: Alfred Newman sat beside his wife Harriet (née Cooper). Photo: Carol Trigg. Alfred moved away from Swaffham Bulbeck to Ely between the 1871 and 1881 censuses. In 1877 he married Harriet Cooper of Ely. Their marriage is recorded in the parish register of St Mary's Church, Ely, but a note states that 'Marriages from 3rd October 1877 to 29th March 1879 took place in the Boy's National School Room'. The Boy's National School was located on Silver Street, Ely. I can only assume that the church was undergoing repairs during this period as there are many marriages during this period, and surely can't have been due to a specific reason relating to the bride or groom. The couple went on to have 13 children - but sadly, the penultimate child, Selina, died when she was about 2 years old. The family lived initially in Church Lane (1881), and later near the Waterside area of Ely. Alfred worked as a Coprolite Digger, a Platelayer, and after he had moved to Ely he became a Brewer's Labourer. 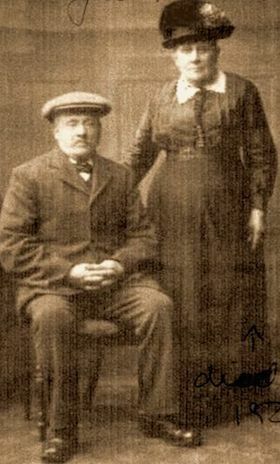 Alfred out-lived his wife Harriet by about 8 years, before dying in 1933 at the home of his son Frederick, at Waterside, Ely. 7th May 1849 at Swaffham Bulbeck, Cambridgeshire, England. 24th June 1849 at St. Mary's Church, Swaffham Bulbeck, Cambridgeshire, England. Harriet Cooper (1854-1925) on 3rd June 1877 at The National Boy's School, Silver Street, Ely, Cambridgeshire, England. 1851: 1yr, Swaffham Bulbeck, Cambridgeshire, England. 1861: 11yrs, Village Street, Swaffham Bulbeck, Cambridgeshire, England. 1871: 21yrs, Mill Lane, Swaffham Bulbeck, Cambridgeshire, England. 1881: 31yrs, Church Lane, Ely, Cambridgeshire, England. 1891: 40yrs, Bull Lane, Ely, Cambridgeshire, England. 1901: 50yrs, Bull Lane, Ely, Cambridgeshire, England. 1911: 61yrs, Willow Walk, Ely, Cambridgeshire, England. 1933: 83yrs, 54 Waterside, Ely, Cambridgeshire, England. 13th March 1933 in 54 Waterside, Ely, Cambridgeshire, England, aged 83 years. 17th March 1933 in grave #G23(c) with his wife Harriet, in Ely City Cemetery, Ely, Cambridgeshire, England.